On May 9, 2013, The Writer’s Coffee Shop Publishing House is set to release its latest romance, Over The Edge by Sydney native Suzanne Carroll . Life is full of second chances. Zoe Harper is hoping her second chance will lead to the life of happiness she’s longed for. With Zoe’s wedding to Dan Costi, a very prominent Sydney socialite, looming ahead of her, an unexpected gift from her future mother-in-law makes her realize it’s all a mistake. With the wedding cancelled and a new attitude in place, Zoe sets out on a fresh course. She makes a list: travel, career, and no romantic entanglements. It’s all in the plan, until she meets Angus. In six weeks, Angus Creed is supposed to waltz at a New York charity ball. Only problem is, the handsome billionaire construction magnate with the tabloid past can’t dance. Not one step. What starts as dancing lessons becomes something more. Angus begins to let down his guard, and as Zoe discovers the real man behind the headlines, she questions where her new choices are taking her. But by the time she works out what she really wants, it may be too late. Over The Edge is a funny, witty and warm story about the many unexpected twists and turns life provides and the joy that can be found when you least expect it. 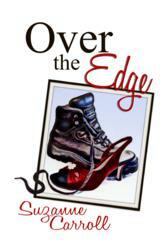 Over The Edge will be available in print and ebook format on May 9, 2013 on Amazon, B&N.com, iTunes, Kobo and ph.thewriterscoffeeshop.com. Suzanne Carroll lives in Sydney with her husband and children. By day she works in an office where she sneakily scribbles plot ideas on yellow sticky notes and hopes they don't accidentally end up on the departmental monthly report. One such sticky note has turned into her first novel, Over the Edge.